Because you don’t get to pick the call. Policies and procedures to protect officer, agency, and the public. 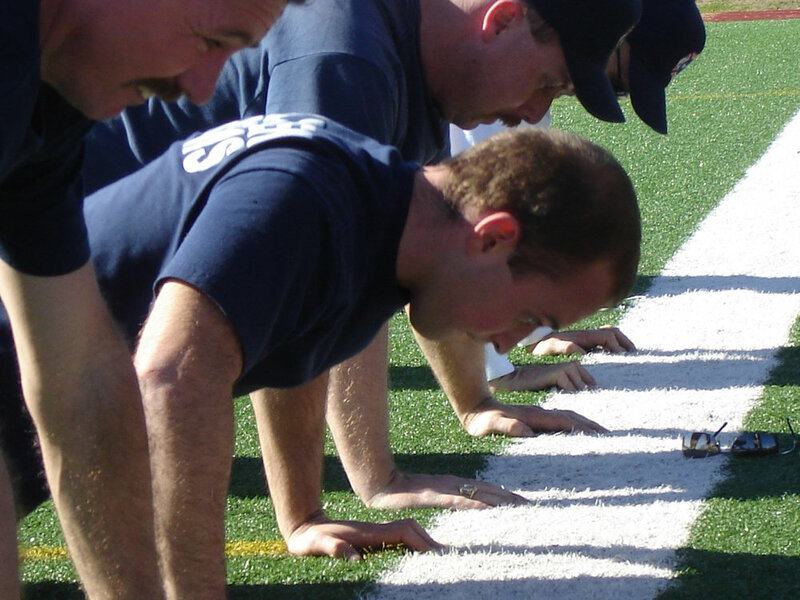 There is a long history of physical fitness testing of individuals in work and the military. Validity evidence allows an agency to make sound human capital decisions that are lawful and productive. Litigation around physical testing in public safety has mostly focused on how testing is conducted and the ensuing employment decisions. FitForce is a third party solution for agencies requiring testing services. Career-span education is the foundation upon which the Physical Readiness Program is built. The goal is to guide and support behavior change. We have recruit, incumbent, and instructor training. Career-span physical training & education is necessary to ensure the safe and effective performance of the essential physical tasks. Continuity of content, approach, and philosophy in training is essential. The roles and responsibilities of the people, positions, and divisions in an agency are comprehensively outlined in its policies and procedures which are consistently applied and reliably enforced. A lack of physical readiness should never compromise the agency's mission. Let our in-house and contracted legal team anticipate, prepare, and if necessary, defend your lawful employment decisions. The FitForce definition: Physical Readiness is the current and predictable ability to perform the essential, non-negotiable physical tasks required of the position, without warning or opportunity to prepare, relying upon a trained body, mind, and spirit to ensure safe and effective performance in service of agency, family, and self, today and in the future. It's a tall order for an agency or an individual to live up to on a regular basis, yet this is what is required of the public safety community if it is to fulfill its mission. The challenges are further compounded by the presence of anti-discrimination and other regulatory requirements, conflicting interpretations of some of those mandates by enforcement agencies, predictable labor-management strife, budget limitations, and ever diminishing applicant pools. To negotiate this landscape, to ensure continued mission success, and to faithfully serve the community while protecting the rights of the workforce, the agency's policies and procedures must carefully and thoroughly integrate the demands of the job with the resources necessary for continued safe and effective performance. Being in the job is not the same thing as being able to do the job. Virtually every agency has somebody who is "in the job" who hasn't been required to do the job in a very long time. Due to the infrequent nature of many of the most consequential job tasks (think firearms use), it is critical agencies undertake valid, career-span Physical Readiness Testing to predict and to provide assurance of a positive outcome.Tests of physical fitness, especially those attached to age- and gender-adjusted standards, are simply assessments with little bearing on job performance. However, the presence of validity evidence which links the demands of the job to the outcome on a test of basic ability, allows the employer to predict with a high degree of certainty, safe and effective physical job performance at lawfully mandated minimum levels. Tests alone do not ensure success. Training is the foundation of the Physical Readiness Program which is outlined in the agency’s policies and procedures. The program must be multi-faceted and it must have the support of agency leadership if it is to succeed. The predictable application of training mandates helps to ensure the physical readiness of the workforce through ongoing education, screening, assessment, support, and a plan to phase-in the program, particularly a new program, over time, to eventually include all sworn personnel. Human capital is the agency's greatest resource. The goal is not eliminate personnel as a result of testing but instead to support the officers as they change to and maintain behaviors consistent with physical readiness. It is difficult to know if an agency will be challenged over an employment procedure and impossible to guarantee it will prevail. However, our experience with Arbitration and Litigation tells us there are certain best practices an agency can undertake to avoid or successfully respond to such a claim. As with personal self defense, our first option is always to avoid the fight with effective policy while maintaining an appropriate level of preparedness should a defense be necessary. Defensible and evidence-related human capital decisions based upon the predictable application and consistent enforcement of policies and procedures help to avoid or defend against a challenge should one arise. We recently wrote about the new Physical Activity Guidelines which exhort ALL Americans to get up and get moving. Newly published evidence now supports swapping 30 minutes of daily sitting with the same amount of any intensity activity may dramatically reduce the risk of early death. The ADA seeks to ensure those who can do the job are not denied employment due to disability. Do you knees hurt as much as mine? Meta-analysis evaluating the efficacy of collagen supplementation on osteoarthritis (OA) symptoms. Have questions? You can contact us below. We'll also sign you up for our newsletter.